OSHA’s staff in Region 7 has been challenged to meet an audacious goal: zero. The region, which covers Iowa, Kansas, Missouri and Nebraska, is striving to achieve zero workplace fatalities, said regional administrator Charles Adkins, who has been with OSHA since its inception more than 40 years ago. Region 7 has experienced a reduction in its fatality rate over the past few years. “It’s a long, bumpy road, but we’ll get there,” Adkins said of the quest for zero workplace fatalities. 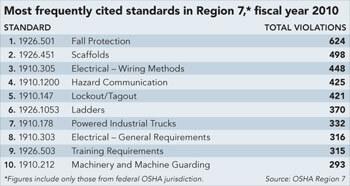 Several years ago, the region had trouble hitting its target number of inspections each year. Staff would wait until the end of the year, then go out and attempt to perform a large number of inspections, which would result in Region 7 not getting anywhere near its targeted goal, according to Adkins. Now, the region takes the target number of inspections and divides it by 52 to create a weekly goal for inspectors. Coupled with this is an incentive program – area offices that hit their weekly goal receive a point, and the office with the most points at the end of the year receives a small amount of extra funding for the purchase of equipment. The end result was offices began hitting their goals week in and week out, and every office was being awarded all possible points. In fact, Adkins said, Region 7 does better than the national average at meeting its goals: The region completed its inspections plus an additional 0.3 percent; the national average missed the inspection goal by 0.2 percent. The region’s whistleblower investigators have a high case load (the region has 5 percent of the investigators in the country, but handles 8.8 percent of the total cases received by OSHA), but those investigators continue to meet their goals. According to Adkins, 41 percent of all whistleblower cases are resolved within 90 days – 10 percentage points higher than the national average. For anyone who believes Region 7 merely dismisses a bulk of those cases as having no merit, Adkins quickly points out that the region’s merit rate is 47 percent, compared with the national average merit rate of 29 percent. One emerging challenge for Region 7 has been the growth of the indoor hog farming industry. “You’ve got 2,000 or 3,000 hogs in a building,” Adkins said. “These are bringing about some unique challenges.” A variety of dangers exists in such a workplace, including hazardous gas; disease; trampling; and slips, trips and falls. Another issue Region 7 has to deal with is some areas are – in Adkins’ words – “anti-OSHA.” These are areas that are quick to notify their congressional representatives when they believe the agency is doing something wrong, and those representatives in turn meet with region officials to address the concerns. Region officials then explain the importance of any given OSHA move to prevent injuries. Recently, some concern has been raised about a new residential construction fall directive, which requires residential construction workers to comply with fall protection standards. “We’re doing a lot of outreach with them, letting them know how to come in compliance,” Adkins said. Some of that outreach has led to success. Region 7 is home to the first nursing home to be accepted into OSHA’s Voluntary Protection Programs, where the facility developed a program to address a number of ergonomics issues. The region also, at one point, had the only battery manufacturer in the country to be involved in VPP, a particularly notable achievement considering the ongoing fight in the country and region to reduce lead exposure levels.